Hi folks. I just got back from a 42km run that took me up to Witikon then down to the Greifensee. Once at the Greifensee I did one complete lap of the lake and then I made my way back to Zurich along the same route. I ran the whole way basically, but stopped every 10km for a snack and a drink. 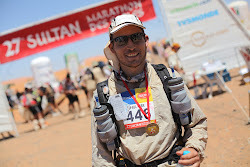 10km is the distance between the checkpoints in the MDS, so it is good for me to get used to stopping every 10km and then having to get back in to the rhythm again. It was my first time running with such a heavy pack. I had weighed the pack in at 7.5kg but probably it was over 8kg by the time I put in the drinks and snacks that I bought in Zurich HB. It felt pretty comfortable running with the pack and there was very little bouncing. The only minor point was something at the bottom of the pack seemed to be digging in my back and I had to adjust the position from time to time. The actual pack I will be using in the MDS has not yet arrived, and the one I am currently using is more for mountaineering than for running. Despite the pack being comfortable to run with, my quads were getting a lot more tired than they usually do. This was probably due to the extra weight bearing down on them (although the weight of me plus the pack now is the same weight I used to weigh all by myself when I first started running again just over 1 year ago). I was fine plodding along the flat or going uphill, but as soon as I got to the downhill part from Witikon towards Zurich they were really sore. I was trying to run down the hill as gingerly as possible. I had been considering to run 80km today, but I changed my mind as I was starting to get a little bit cold towards the end and if I ran much further I probably wouldn't have been able to run tomorrow. Earlier in the day the temperature was perfect though. The Greifensee seemed to be completely frozen but I don't think the ice is that stable and it will probably melt very soon. The temperature has really risen over the last couple of days. Only last week I was running over a frozen Katzensee - the first time I can say that I have run on a frozen lake. I was a little bit nervous doing it, but there were plenty of people iceskating on it so I assumed they knew what they were doing and had been told by the authorities it was safe. There was no way I was running on the Greifensee today though, and there were police cordons all around the edge, which were probably to warn people that it was not safe. Tomorrow I have Pilates in the morning and then I want to go to hot yoga. I purchased a 1 month abo so I want to make use of it. After that I would like to go for another run. If I am still feeling fresh it will be a run with the same pack I used today (just under 8kg) and if I am feeling tired and aching a bit I will go without a pack. Remember that my biggest danger now is not a lack of training but getting an injury from doing too much.